Editor's note: Welcome to another installment of Page 2's "Behind the Highlights," an occasional series which examines the details of compelling, obscure, breathtaking and stupefying video clips, as told by the figures in and around the action. You had to see it to believe it. Even then, you probably wouldn't have believed what you just saw. 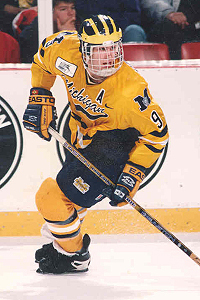 In a 1996 NCAA tournament game between Michigan and Minnesota, Wolverines right wing Mike Legg scored on a puck-flipping, lacrosse-style trick shot that became the most famous goal in college hockey history, a sports highlight-reel staple to this day. With this year's Frozen Four getting under way in Detroit, Page 2 revisits Legg's spectacular goal -- and the story behind it. as well as a slender, less-celebrated junior winger named Mike Legg. BRENDAN MORRISON, Michigan center: "Legger was very skilled on offense. Put up good numbers at school, huge numbers in juniors. And everyone liked him. He's very laid-back." 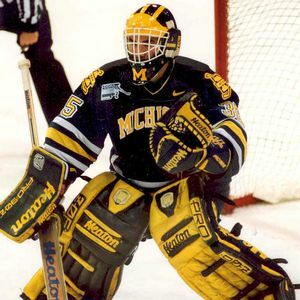 MARTY TURCO, Michigan goaltender: "Mike was a good dancer, a happy guy all the time. He had some Michael Jackson moves at college parties." MORRISON: "I can confirm that. Mike loves music. He always liked to be the DJ in the locker room." TURCO: "Mike did that shot all day, every day. It was like the last thing he did before he got off the ice in warm-ups and practice." LEGG: "You could probably do it by the end of the day if I showed you how. It just takes a few hours. But to get so good at it that I could just do it any time I wanted, it took a real long time to get that confidence." TURCO: "He started trying to go the other way, left to right. I'd see him flipping the puck over the top of the net. The kicker came when he started doing it on breakaways, like a lacrosse shot. He was so good at it." MORRISON: "I've fooled around with the same shot. But it never crossed my mind to try it in a game. [Laughs]." Between 1948 and 1964, Michigan won seven Division I hockey championships -- a Wooden-esque legacy that only increased the pressure on Wolverines coach Red Berenson and the 1995-96 team. In three of the previous four seasons, Michigan reached the NCAA semifinals but failed to advance. MORRISON: "My freshman year, we had the No. 1-ranked team the majority of the season. [In the NCAA tournament], we lose to Lake Superior State in overtime. We had beaten them like four or five times previously. My sophomore year, we get to the Frozen Four, then lose to Maine in triple overtime." BERENSON: "When we got upset by Maine, it was like a championship game. We came back the next year really motivated to get to the [Frozen] Four. Our team was on a mission." MORRISON: "People thought that we could attract the top talent, but when it mattered most, we could never pull it off." BERENSON: "We were fighting the notion that Michigan can't win the big one." Michigan entered the 1996 tournament with a 31-7-2 record and a No. 2 seed. After receiving a first-round bye, it traveled to Munn Arena in East Lansing, Mich., to face No. 3 seed Minnesota, which had defeated the Wolverines during the regular season. AL RANDALL, Michigan radio announcer: "Minnesota beat us good in the College Hockey Showcase that year. Going up against them again was a real challenge for us." STEVE DeBUS, Minnesota goalkeeper: "We were good. We had an unbelievable undefeated streak [Minnesota went 18-0-1 during a 19-game span earlier that season]. We had good seniors, good young players, a mix of everything. As a team, we felt confident." MORRISON: "We were playing in Michigan State's home rink. They don't take too kindly to Wolverines there. We had a pretty big contingent of fans. But everyone else was definitely against us." Minnesota dominated early, taking a 2-1 lead behind a short-handed goal from Nick Checco and a scrambling rebound shot by Jay Moser. The Wolverines were outshot 13-3 in the first period -- the fewest shots taken by Michigan in any period that season. Do you have a suggested video clip for Page 2's "Behind the Highlights" series? Click here to make your nomination. MORRISON: "They came out playing hard." TURCO: "We were getting slapped pretty good." RANDALL: "Minnesota was killing them. They had all kinds of momentum." DOUG WOOG, Minnesota coach: "We had them. You know when you have somebody on the ropes. Michigan may have been a better team, but they weren't playing better that day." BERENSON: "Our bench was pretty dead at that point. We were down. All the fans were cheering against us. We were just hanging on." LEGG: "That was one of Marty Turco's greatest games. He was unbelievable. The rest of us needed a change. Something else. And we couldn't [start a] fight or anything. [Laughs]." TURCO: "We knew we'd turn it around at some point. But we didn't know it would be in that form." MORRISON: "I remember clearly. We're down a goal. I was playing the point. There was a bit of a scramble." RANDALL: "John Madden had the puck. He was going along the end boards." LEGG: "Their defenseman jumped on [Madden], hit him and tackled him. They both slid to the ice. The puck squirted out." STEVE HALKO, Michigan defenseman: "Somehow, the puck ended up on Mike's stick." LEGG: "I was already behind the net. It was perfect timing." 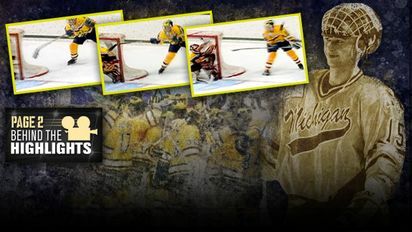 University of Michigan Mike Legg scored 60 career goals for the Wolverines, none more famous than his dunk against Minnesota. MORRISON: "Nobody challenged Mike. He was just standing back there." TURCO: "If people knew Mike could do that move, they wouldn't have given him time and space." LEGG: "We're in the playoffs, so I had been telling myself, 'Don't even think about it. Get that crap out of your head. Don't do anything silly. If there's even a half-open player, try to get the puck to him.'" MORRISON: "I was sneaking into the point." LEGG: "I looked around and didn't really see anybody open." MORRISON: "All of a sudden, Mike leaned down and scooped it." BERENSON: "I thought, 'Oh my God, he's going to try it.' I saw him shoot it 100 times in practice, just fooling around. I hadn't coached him into it." LEGG: "Red gave me the green light one day after practice. He asked me if I thought [the shot] was legal. In games, I had been asking referees the same thing. I would show them how I did it, ask them the rules. The referees said yes. I passed it on to Coach. He just looked at me and said, 'Well then, why don't you do it?'" BERENSON: "I'm not a coach that supports hot dog-type moves in hockey. But on the other hand, if a kid can score goals and had the skill, then go for it." LEGG: "I was in a comfortable position. The goalie was protecting from a slam-dunk around the bottom corner. I was hoping that he would be thinking that. That's when you go over the shoulder." MORRISON: "I'm thinking, 'No way. There's no way he's doing this right now.'" LEGG: "I was like, 'Let's do it.'" While Legg's lacrosse-style shot made him famous, he didn't invent the move. Nor was he the first hockey player to use it in an official game. Enter Bill Armstrong, a former Western Michigan player and career minor leaguer. BERENSON: "I think Mike learned the shot from a kid in London, Ontario [Legg's hometown], that played in the minors." LEGG: "I learned it from Bill Armstrong. He was in the New Jersey Devils organization." ARMSTRONG: "We're both from London. Basically, I was getting ready to go off to training camp, skating with the best people in the area. You work out, scrimmage. I was doing the move out there in those [pickup] games." LEGG: "It was the summer before my freshman year of college . You get there early, skate around, no real goalies." ARMSTRONG: "As a pro, you're on the ice a lot. I learned to pick up the puck pretty well on my stick. It was almost second nature. Anyway, I originally would pick it up coming down the wing in stride, spin around and throw it over my shoulder, like a lacrosse shot. One day, I was standing behind the net, picked it up and put it in the top corner. I thought, 'Jeez, that might be something I could actually use in a game.'" 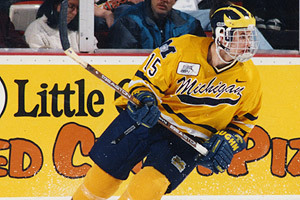 University of Michigan Legg went on to score several pro goals with the "high wrap" before retiring from hockey in 2003. LEGG: "Bill has great hands. I'll never forget, one day I'm watching him, maybe from the far blue line, and he does something." ARMSTRONG: "First thing you do, you lay the blade of the stick as flat on the top of puck as you can. Then, you try to tip the puck back so it's on its back edge. Most people from this point try to turn their wrist to pick the puck up. But you need leverage. So you pull it back, and then flip your wrist -- give puck momentum to get on top of your stick. It's all about feel." LEGG: "It was the move. I'm like, 'Oh, my goodness, I have to see this again.'" ARMSTRONG: "I worked on it in my spare time. Worked on it at hockey schools while the kids were practicing plays. I was playing in Hershey, Pa. I didn't want to try it in a game and miss. When I was traded to the Devils, I played in Albany, N.Y., with the River Rats. I did it for fun in our East-West games. My coach, Robbie Ftorek, said, 'You do it so easily, why don't you try it?' So I did. I finally had permission." LEGG: "At first, I didn't really have the nerve to talk to Bill. I would just watch him." ARMSTRONG: "In Albany, I scored four goals with the move. The fans there got to know it because they ran a piece on local television. So I would get behind the net -- maybe only 3,000 people are in the building -- and I'd hear the fans yelling, 'Do it! Do it!' We called the shot the 'do it.' When I went to the IHL, they asked me what to call it. I said, 'I guess you call it the high wrap.'" LEGG: "I finally asked Bill, 'How do you do that?'" ARMSTRONG: "I pulled him aside and showed him how to get the puck on your stick." LEGG: "I just fell in love with it." ARMSTRONG: "Mike picked it up pretty quick." LEGG: "I didn't want to pester Bill, so I just tried it and tried it and tried it when I had private time on the ice." ARMSTRONG: "Mike said to me, 'I'm going to try this year in a game.' I said, 'Yeah, you're not going to try it.' [Laughs]." DeBUS: "I didn't see [Legg] lift the puck. When his stick was coming up, I thought the puck was caught in the netting and he was trying to knock it out." ARMSTRONG: "Goalies are trained to be firm on the post for a wraparound. The high wrap is a surprise thing. If you're on one side of the net and switch, they do a pad slide over. You pick that puck up when they're doing that shift. They're covering the low corner and the top corner is available." LEGG: "I go on the toe of my stick. Put my stick on top of the puck. There's centrifugal force from pulling the puck backwards and winging it around to the left hand side, like a pizza tray. You flip it over, step toward the target, shift the weight. It's hard to explain. I'd rather show you." DeBUS: "Next thing I know, here comes a stick around at my face. And I'm like, 'Oh, my God.'" BERENSON: "Part of you is saying, 'What is he doing? This is too important a game to try some gimmicky move.'" DeBUS: "Then it's in. And there's that moment where it's like, 'What the hell just happened?'" WOOG: "I saw the stick. I don't know if I saw the puck. All I thought was, 'Oh no, the light's on.'" RANDALL: "Everybody knew the puck went into the net, because the light went off. But I don't know if anybody knew how. It happened in the blink of an eye. Nobody was prepared." WYATT SMITH, Minnesota center: "We were all in disbelief, just looking at each other. I looked at one of our defensemen. He looked at me. I looked at the floor. We all had the same blank look." TURCO: "The whole arena was just -- just silent." ARMSTRONG: "When you score on a high wrap, it's shock. More shock than pandemonium. I think five of the eight goals I scored, there was complete silence after the goal. The refs didn't know whether to call it. The fans didn't know if they should cheer. Our bench didn't know if they should cheer. The other team didn't know if they should be mad or not." RANDALL: "I thought that Legg shot the puck from behind the net and hit the back shoulder of the goalie and it went in." DeBUS: "The ref comes over and he has a puzzled look and he's like, 'What did I just see?'" MORRISON: "They don't signal goal right away. They're just kind of standing there, I think in awe of the moment." University of Michigan Brendan Morrison is pursuing his first Stanley Cup win this season with the Washington Capitals. BERENSON: "I was worried that one of the referees might do something -- not stupid -- but overreact and say, 'You can't score that way.' You never know. That's the first time they've seen it, too." TURCO: "People assumed it was a bad goal." MORRISON: "Everyone was just kind of shaking their heads. Did that really happen? Is that a good goal?" SMITH: "Initially, I thought it was a high stick. But then I realized he threw it under the crossbar, so that's not the case." BERENSON: "It wasn't like he batted it out from five feet high. He controlled the puck and put it in." MORRISON: "Finally, the referee signaled goal. It was pretty loud then." BERENSON: "Holy jeez, our bench and everyone went crazy. You could see the look of amazement in the rink." HALKO: "It was, 'I can't believe he tried it in a game. I can't believe he tried it in this game.'" LEGG: "It was one of those things that you practice and practice and practice something so long -- like a triple salchow or something -- and when you finally do it, you're elated. And I was pumped we were on the board." MORRISON: "We erupt. Right away, we're charging into the corner, jumping on each other, going nuts." Michigan went on to win 4-3, advancing to the Frozen Four. Opponents and teammates credited Legg's first postseason goal with shifting the game's momentum. SMITH: "That goal did deflate us a little bit." BERENSON: "It really broke the tension and whatever it was with our team." DeBUS: "The game continued on. I forgot about it. The game was still in reach." SMITH: "We got back to the bench and Coach [Woog] was a bit upset. But we looked at him -- 'Hey, [Legg] picked it up. He didn't make a pass out, didn't find the open man.' What else were we supposed to do?" TURCO: "It was the single biggest change of pace in a game that I've ever been a part of in the game of hockey. Any level." WOOG: "I was just hoping we could get out of the period with a lead. The longer we had the lead, the more they squeezed. They couldn't generate. The noose was tightening. That goal took the pressure off them." TURCO: "It was a still a back-and-forth game, but after that, there was no way we were going to lose." Michigan blanked Boston University 4-0 in the NCAA semifinals, then beat Colorado College 3-2 in overtime for the school's first championship in three decades. Morrison, Halko and Turco were named to the all-tournament team -- and once again, Legg made a key contribution. HALKO: "I'll never forget when we got together that next Monday, Mel Pearson, our assistant coach, got up and said, 'I hope that that goal will not be the highlight of our season.'" MORRISON: "[Legg's goal] gave us a bit of a swagger. We're the team that has the guy who pulled that move off. It definitely helped us." University of Michigan Morrison celebrates his winning goal in overtime of the 1996 NCAA title game against Colorado College. HALKO: "In the championship game a week later in Cincinnati, Mike scored the tying goal in the third period." LEGG: "That goal wasn't as pretty, but it was bigger." MORRISON: "It's hard to say which one was bigger. You can't have one without the other." TURCO: "[The high-wrap goal] was our springboard. The one thing we can look to as the turnaround, the one moment in time." BERENSON: "That Colorado [College] game took like 10 years of [pressure] off me. We had done everything but win it all." MORRISON: "The program really asserted itself. Not only are we a good program each and every year, but yeah, we can win the big game." RANDALL: "That was my first year calling Michigan games. Red looked at me and said, 'All of us have been working so hard for a national championship. You come here and see one in your first year. What do you have to look forward to now?'" As the Wolverines celebrated their title, Legg's goal took on a life of its own -- even without YouTube and Twitter. DeBUS: "It was after the [Michigan-Minnesota] game, about two and a half hours. We're at the airport. I see [Legg's] goal on Headline News." ARMSTRONG: "I had already scored six goals [with the high wrap] in the AHL before Mike did his. We were sending tapes into ESPN, but our video was so bad back then, my PR guy said they wouldn't use them. They were too grainy." LEGG: "My sister was flying somewhere in Florida, sitting in the airport. They have CNN. She looks at the screen and they show my goal. She's standing on her chair, looking at the TV, saying, 'That's my brother!' She calls me, keeps asking 'Mike, what did you do?'" TURCO: "After the Minnesota game, we were pretty crazy in the locker room. During the two-hour bus trip back home, we got a chance to decompress. But when we got back, the phones are ringing off the hook. Mike's goal is on every national sports show. That led off everything." ARMSTRONG: "There's a lot of irony there. I was playing with the Detroit Vipers at the time. We're in the same state. I'm a pro; Mike's in college. The day before Mike scored, I scored a high wrap for Detroit. The Pistons' camera crew was there, so we had good tape. The team PR guy sent it to ESPN. Off I go to bed. I get up, go to practice. Sunday night, I flip on ESPN and hear, 'There's an amazing shot in hockey.' I think, 'Hey, finally.' And on comes Mike Legg's goal!" BERENSON: "College hockey benefited dramatically from that goal." WOOG: "That was good. Except that it was at our expense." LEGG: "It was surreal. At the [Frozen] Four, me and a couple of guys are in the hotel elevator. A delivery guy is coming up with a pizza. You can tell he doesn't follow hockey. And he's like, 'Are you playing that team with the guy who scored a that weird, funky goal?'" MORRISON: "Legger's goal got a huge amount of notoriety. All these reporters coming in, asking, 'How did you do this? Can you show us?' It was a zoo. He won an ESPY for it." LEGG: "I took my dad, Chuck, [to the ESPYs]. That was awesome. The whole celebrity thing was fun. You get picked up in a limo. Get taken to the hotel. They tell you when you walk the red carpet, 'Don't stop to sign autographs.' I'm thinking, 'Come on, it's me and my dad. Who wants our autographs?' But sure enough, people are coming up, 'Sign this; sign that.' I'm like, 'What?' So I got my dad to sign some stuff." a nine-season NHL career with the Dallas Stars. MORRISON: "Mike just soaked it up, man." LEGG: "Sinbad was there. Kerri Strug. I sat beside Ken Caminiti, met Yasmine Bleeth. I'm sitting third row to the front. They told me, 'We don't know if the Most Outrageous Play award will be televised. But have a speech ready.' I was like, 'Holy smokes.' Nervous. They come back later and say it won't be shown. Whew. I sit back, watch the show. At the end, there's the Play of the Year. They show Desmond Howard's Super Bowl runback. A Caminiti play. Then it's my goal, and it hits me -- I can't be going on that stage. Are you kidding me? I thought I could relax! Desmond Howard won. That was great for me. He's a Michigan guy, and I didn't have to give a speech. [Laughs]." MORRISON: "I think they even flew Mike over to Sweden." [Editor's note: That's correct. Legg went to Stockholm to receive Inside Hockey magazine's Goal of the Year award]. LEGG: "That trip was unbelievable. [Detroit Red Wings defenseman] Nicklas Lidstrom pretty much babysat me the whole time. The award show was this whole European dance party, clothing-line show, plays of the year thing. It was hosted by -- I forget her name, but she was Miss Sweden. I think she had a talk show where she would interview athletes in the sauna. "I'm sitting there, and I'm thinking, 'This is Sweden. They're not going to know me.' Then the host says 'Mike Legg,' and people explode, clapping and cheering. This big screen drops down in the middle of the stage, which is also like a dance floor and a fashion runway. Everybody is high-fiving me. Miss Sweden calls me on stage and hands me this big award. "So I'm feeling pretty cool and cocky. She's looking me up and down. She says, 'How old are you?' I say, 'I'm 21.' She gives me a little hug. I give her an extra little hug. She stops me as I'm walking away, grabs my hand, plants a big kiss on me right on the stage! There was a big picture on the paper the next day of that. I think my dad still has it. "We went out with her and her fiancé afterward on a boating trip. They were nice people." MORRISON: "Isn't Mike's stick in the Hall of Fame?" LEGG: "I forgot about that! It is. They change it out every once in a while. But they told me I get free admission whenever I want. [Laughs]." TURCO: "It took a long time for Mike's party to mellow out." Legg went on to play six seasons of pro hockey in Finland and the U.S. minor leagues in locales ranging from Texas to Georgia to Idaho. He currently works as a firefighter in the Vancouver area. Armstrong is a real estate agent in London, Ontario. Morrison, Turco and Madden are still playing in the NHL. Berenson still coaches Michigan and won a second NCAA championship in 1998. DeBus is an assistant coach at St. Olaf College in Minnesota. Woog, who resigned as Gophers coach in 1999, is now a broadcaster for Fox Sports North and runs youth hockey camps in Minnesota. LEGG: "When I was playing, I didn't really think about it. Looking back, I can see how [the shot] gave me an extra look, opened another door, that kind of thing." ARMSTRONG: "In the end, I scored eight goals [with the high wrap], four in the American league and four in the IHL. When I was in Kansas City, we were trying to set up something for me to go on ["The Late Show with David Letterman"]. But then I got diagnosed with a brain tumor and had to retire. The tumor was supposed to be malignant. Luckily, it was benign." DeBUS: "I was playing in a senior league tournament [recently] and someone brought [Legg's] goal up. [Laughs]. It never goes away. Everybody becomes a goalie coach and gives you their insight as to what they would have done. Or they feel like they've thought of the new funny thing to say. And I'm like, 'Yeah, I've heard that.'" LEGG: "I scored one in the Finnish elite league. I did it in Texas once. And I did it in roller hockey. Against Marty McSorley's brother. He was coaching the Las Vegas team. We're playing at home. Then we go and play in their building. I found out before the game that there was a bounty on my head. The Vegas guys wouldn't get paid that week if they didn't try to kill me. So of course, I tried the move again. I hit the goalie in the shoulder and it dropped down. There was a melee after that." Fourteen years later, Legg's goal lives on, and not simply as a grainy highlight. Sidney Crosby scored on the same move as a junior. Youth players have received attention for lacrosse-style shots. A Canadian professor even wrote about the physics of the high wrap, which has spread as far as Croatia and often is referred to as "The Michigan." BERENSON: "We've been a part of great games, but I can't think of any one individual effort that was more memorable. At our hockey [camp], we'll show kids Mike's goal. All of them will try it." ARMSTRONG: "My son is 10 years old. He does it in the garage all the time." HALKO: "I have two young sons, 9 and 11. I coach a lot of youth hockey. It's amazing now to see all these kids do that. I played hockey for 25 years. I couldn't do it. Now, you get the kids to put the puck in the bag after warm-ups, and half of them cradle it on their sticks to put it the bag." LEGG: "It still blows me away to walk by a rink and see kids trying to do it. I want to jump out there and say, 'Hey, this is how.' I never imagined it would have this much of an impact." ARMSTRONG: "All the people who own the hockey schools, they tell me, don't break out the high wrap until Friday. Otherwise, the kids will be trying to do it all week. If we catch you trying it Monday through Thursday, you're doing push-ups." MORRISON: "It's never been done in the NHL." HALKO: "The unwritten rules of hockey, right? There's a fine line there, trying that on a goalie." MORRISON: "I think guys would be pretty excited to actually pull it off. It's possible you could get run afterward, maybe if you were blowing a team out. But in a tight game, guys would respect that." ARMSTRONG: "I had guys on my pro teams that would try it and do it OK if they had all kinds of time. But no one could do it under pressure, when there's snow on your stick and snow on the ice and somebody's about to check you." HALKO: "It's one thing to hit 350 yards on a driving range. It's different to do it on the first tee at the Masters." DeBUS: "[Legg's goal], hey, great play by him. The guy had the [guts] to do it in a big game. Unfortunately, it's against me. But that's hockey." TURCO: "Oh yeah, we still talk about it. Fourteen years later." HALKO: "We have a big reunion coming up at the Michigan-Michigan State outdoor game in December. I'll have to speak to people at school and see if they can let Mike shoot that shot before the game." LEGG: "My dad can do it. He does it now. He plays pickup hockey." TURCO: "As good as the move was, Steve DeBus almost had that. [Laughs]. It would have been the save of the century, never mind goal of the century." Special thanks to Greg Kinney of the University of Michigan Bentley Historical Library, Matthew Trevor and the University of Michigan sports information department.